Can the owner of a question undelete it with their vote alone? Can they undelete it many times? I understood that in order to delete or undelete, you need the votes of three 10k+ users. If the person who votes to undelete it is the owner, can they do it with just their vote alone? Is it possible to undelete a question many times? I tried undeleting a question 3 times, it works. If a post was deleted by users other than its owner, the owner's undelete vote will no longer instantly undelete - it will be counted just like other users' votes to undelete. 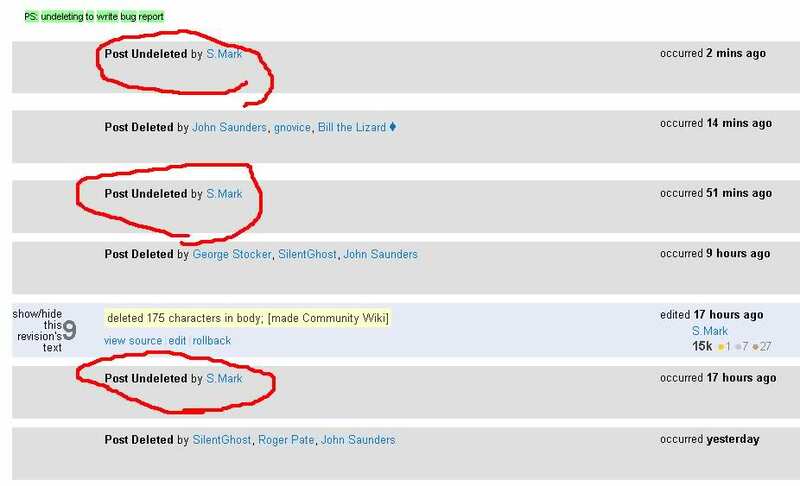 Note that if a moderator participated in the deletion, only another moderator can undelete. If the question is deleted by the owner, they can un-delete it immediately. No voting required. But, when a question is "closed" (the democratic 5-votes-to-close variety), it is then eligible for true deletion buy 10K/Moderator voting. To answer your question, a user cannot (and should not be able to) undo a democratically voted action. When it takes three users to vote-to-delete a question, it should take three users to vote-to-un-delete a question. The original author should not have any more power than the one-man-one-vote in this case. If an answer is "deleted by owner" then it can be undeleted by that owner (alone) too. I assume its the same for questions, I never tried. If I delete my own question I should then be able to un-delete with fair ease. However, if the question is voted by multiple users to delete, an equal (if not greater) number of votes should be required to un-delete. Not the answer you're looking for? Browse other questions tagged bug status-completed undelete . Why can I vote to reopen a deleted question? A methodology to save your posts from the risk of deletion? Why is it possible to vote for deletion/undeletion more than once? Why are users allowed to vote to delete/undelete multiple times?